A cloud-based returns platform connecting all partners and post purchase interactions. A single source system to support all post-purchase issue types, across all returns channels providing full transparency at every level. It has customisable workflows and powerful business rule management. 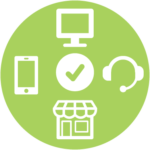 Solvup provides a consistent and cohesive customer experience whether contact is via a retail store, online, talking with a call centre or interacting with a mobile device. The Solvup experience is always seamless. A standardised process for customer returns. Solvup’s workflow engine can be configured to accommodate any return type whether it’s a simple change of mind, product fault, requires repair, or an initial assessment. Retailers have the option to fully or partially integrate Solvup with their current systems including CRM and freight carriers. It will also operate perfectly as a standalone solution.